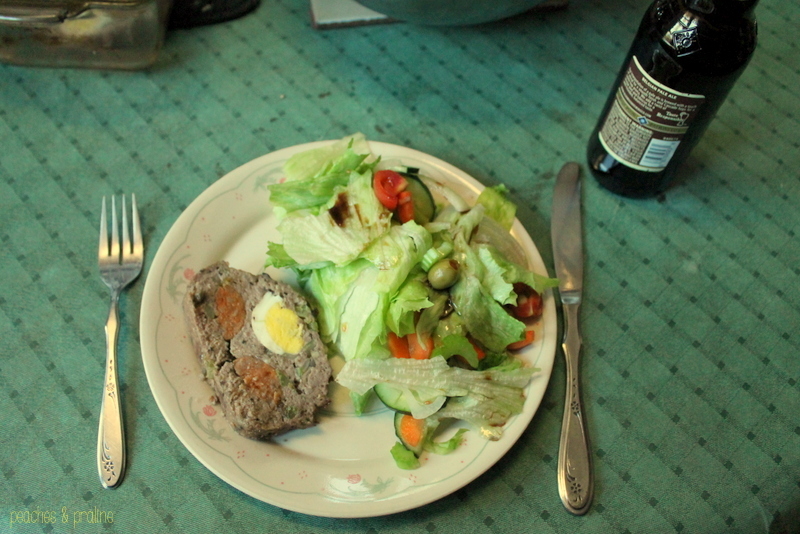 Ever wonder what a Scotch egg would taste like if you deconstructed it and made it in a loaf pan? I didn’t. But I imagine it would be something like this. Glamorous? No. Delicious? Yes. Exactly the thing to do to get my crappo day out of my head? Also yes. 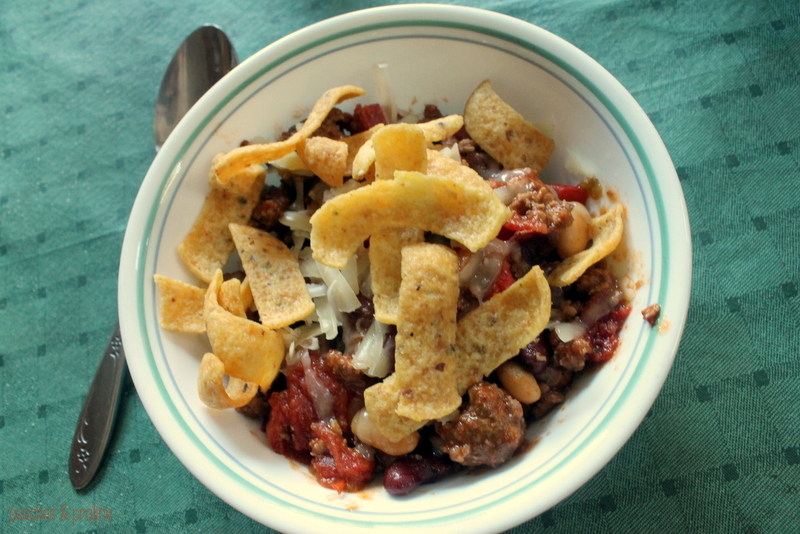 Any dish where you have to squish meat around will instantly make you feel better, I guarantee it. 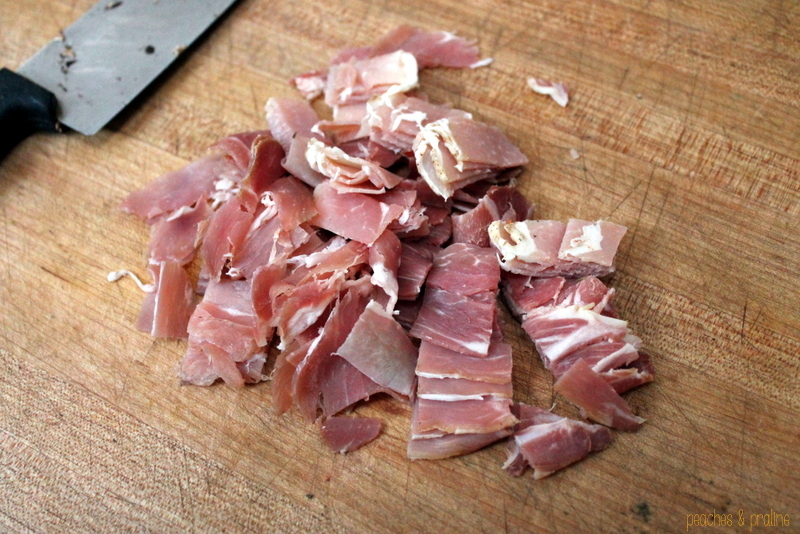 It’s like playing with meaty, delicious Play Dough, but riskier to eat off your fingers when you’re done. 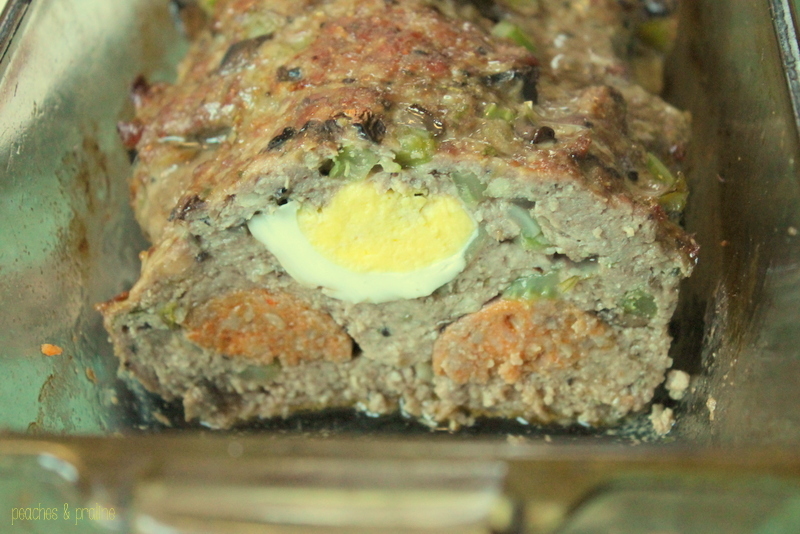 Bottom line is: this meatloaf has too much protein, and I am totally fine with it. Because it’s also delicious. And I sort of want to eat it for breakfast, actually. Is that weird? 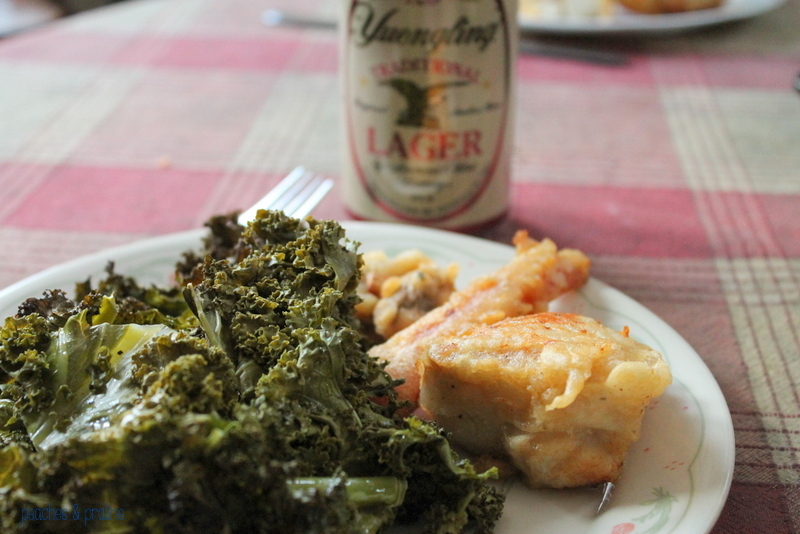 In my defense…it looks completely like breakfast. 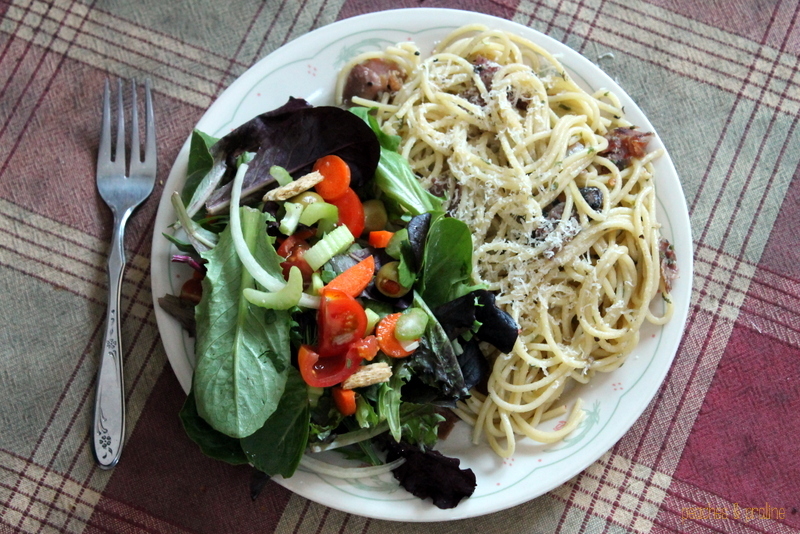 This is the result of three-person collaboration, which is sort of unheard of in my house these days. 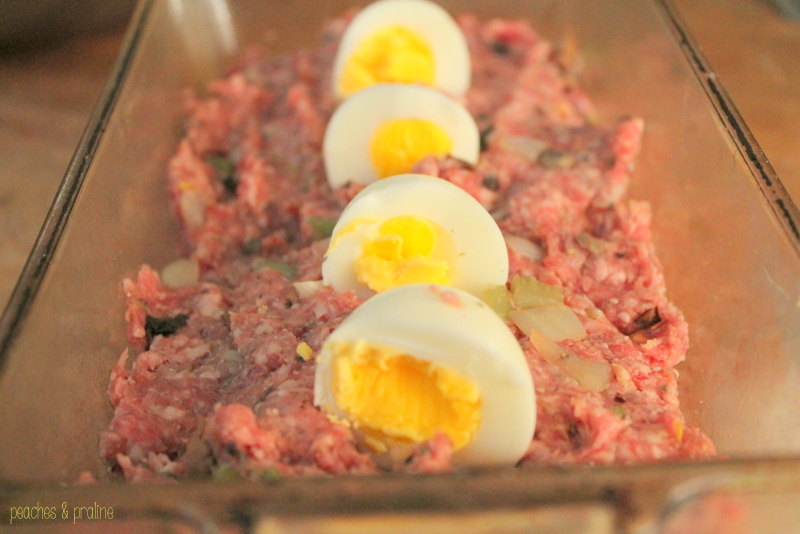 I suggested meatloaf; my dad suggested we add sausage (because he always suggests we add sausage); my mom suggested we add hard boiled eggs. I was skeptical, but she assured me that it was a Thing and we should give it a shot. So we did. 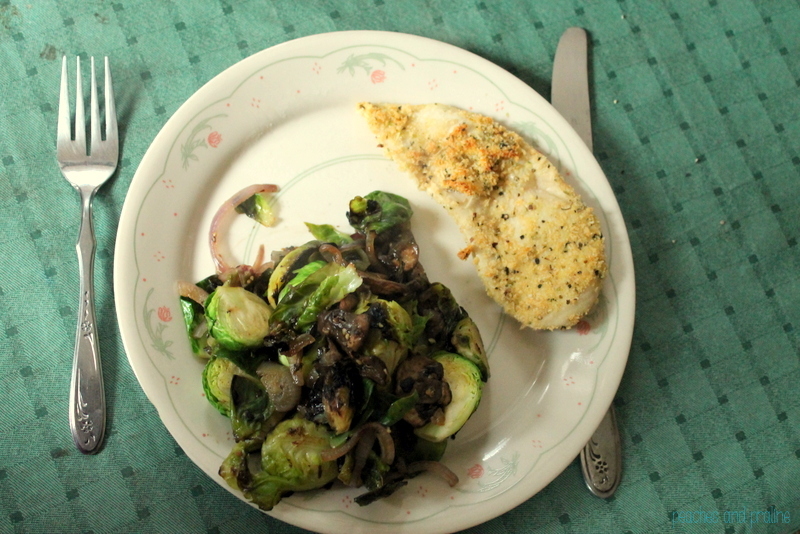 Things started off pretty normal; veg got chopped and lightly sauted with some spice. 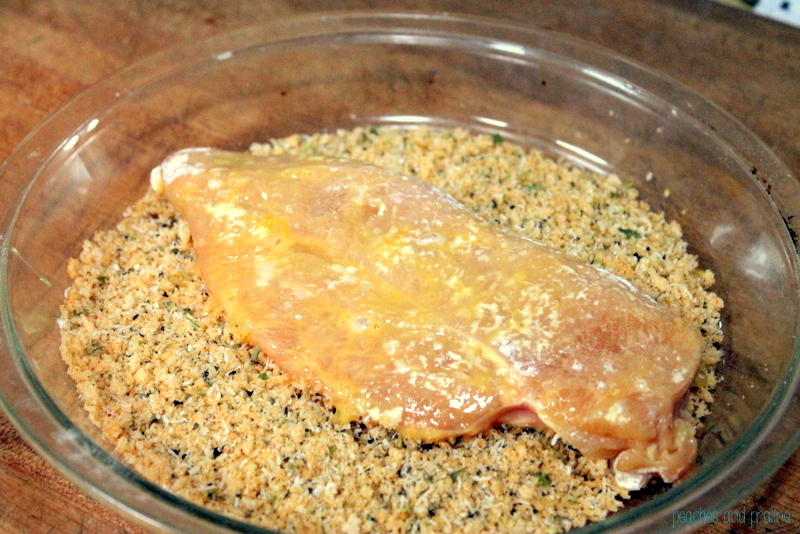 From there it met the meat and got another good spicing, plus some breadcrumbs to bind it. And then the mixing happened. Hands down, this is my favorite part, probably for the same sort of reasons I like kneading bread so much. It’s just– things gooshing through your hands, I don’t know. It’s a stress reliever. 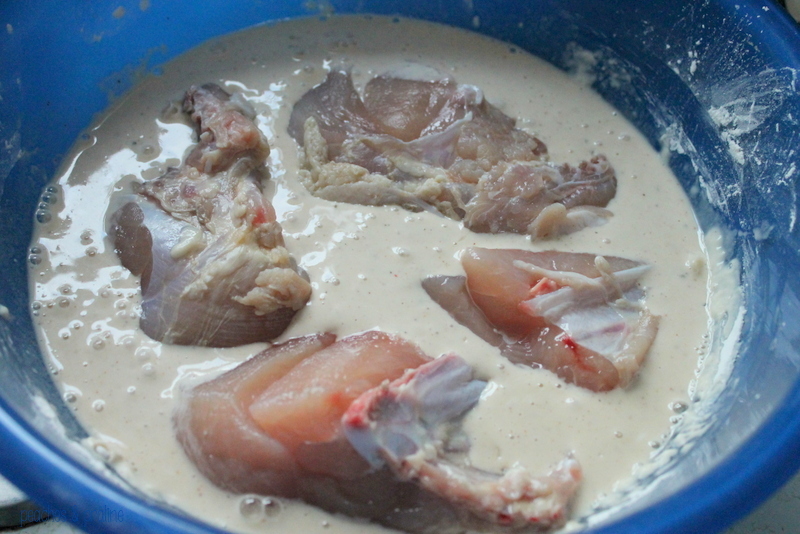 Anyway, moving right along: into the pan we go, with a decent glob of meat pressed down into the sides. 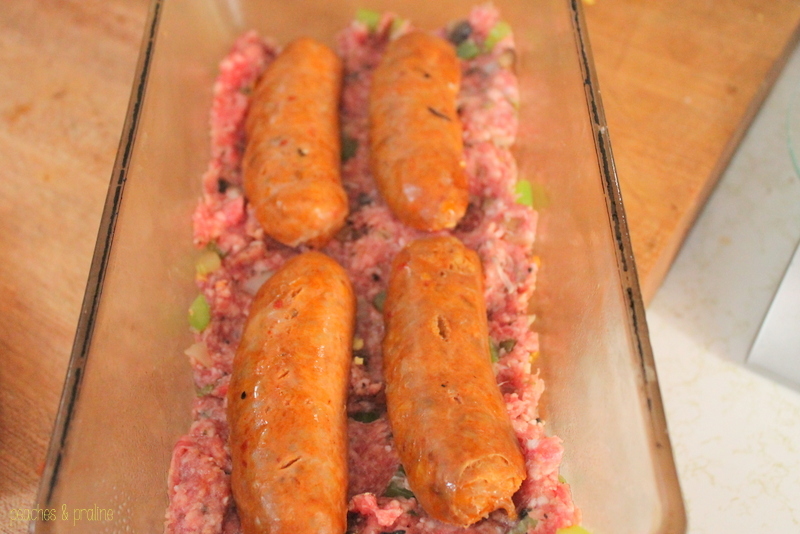 Then a layer of hot Italian sausage; pre-cooked, squeezed for grease, and sliced lengthwise. Another glob of meat goes down on top of this, and you might want to press it out in your hands before you slap it down– pressing it out directly in the pan works, but you risk pushing the sausage out to the edges of the pan as opposed to the center area (which is where you want it). Repeat sausage step with eggs. 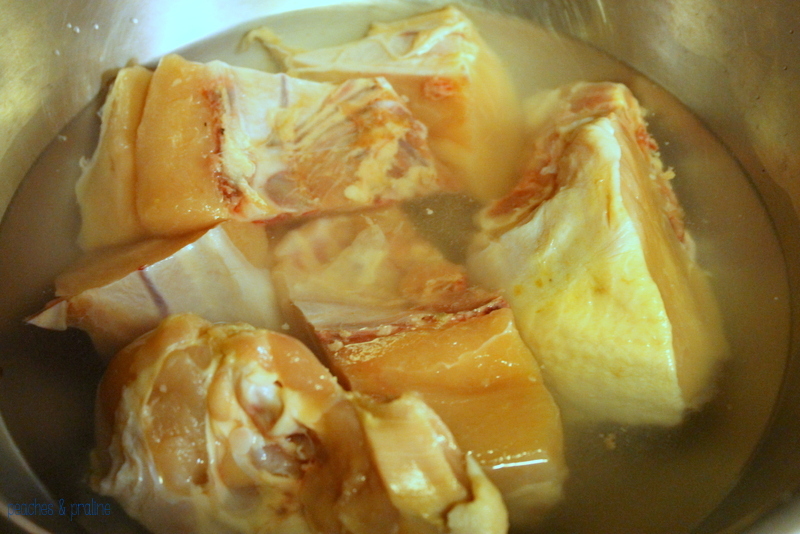 It helps to make a little well for the eggs in the layer of meat underneath them. Top with the last of your meat and you’re good to go. 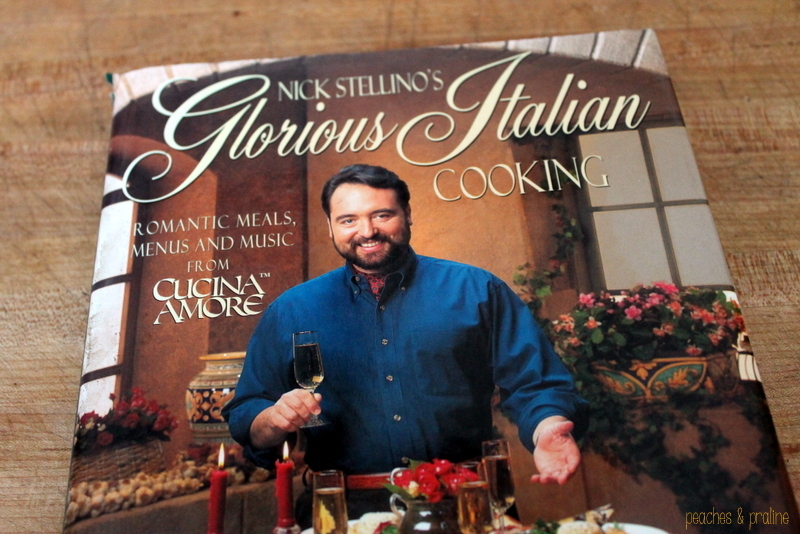 I got you craving meatloaf, didn’t I? 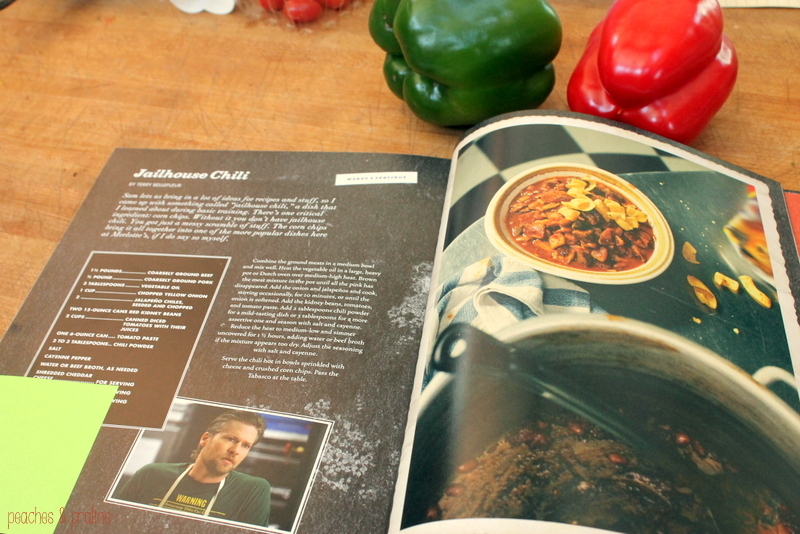 Here, have a recipe. 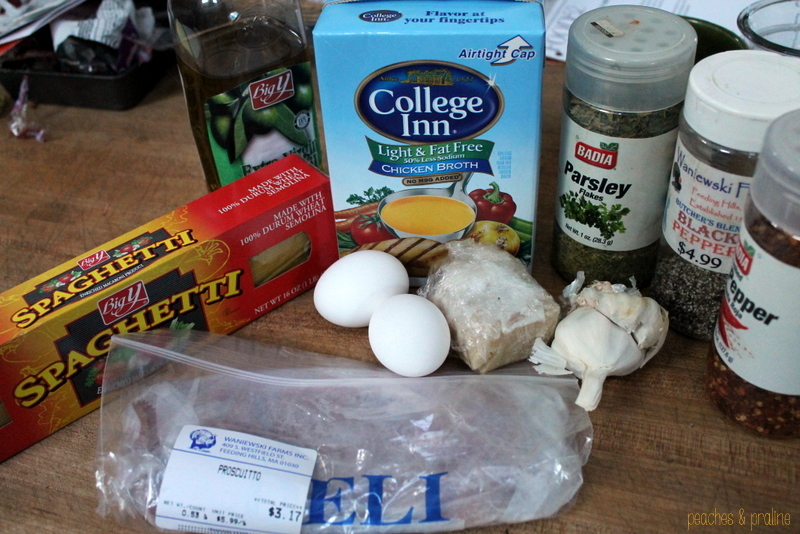 Start your preliminary prep: boil the eggs and cut each in half; cook the sausage links and slice, lengthwise. 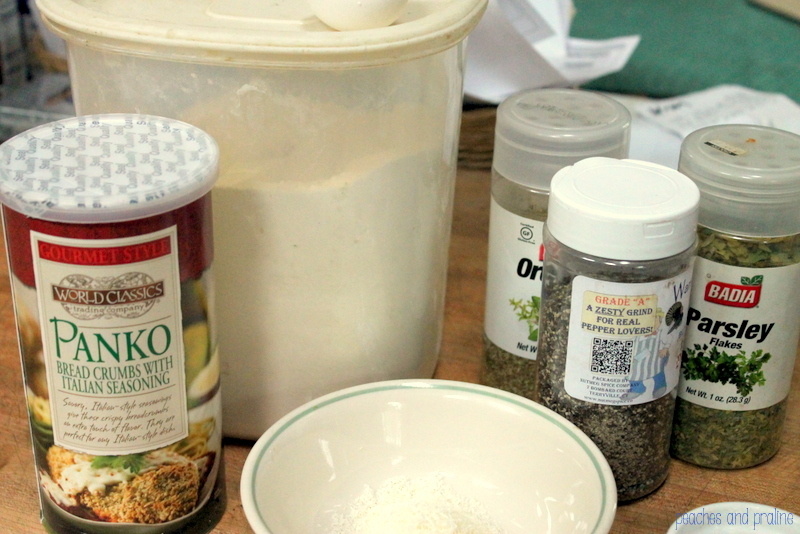 Heat a tablespoon of olive oil over medium-high heat. 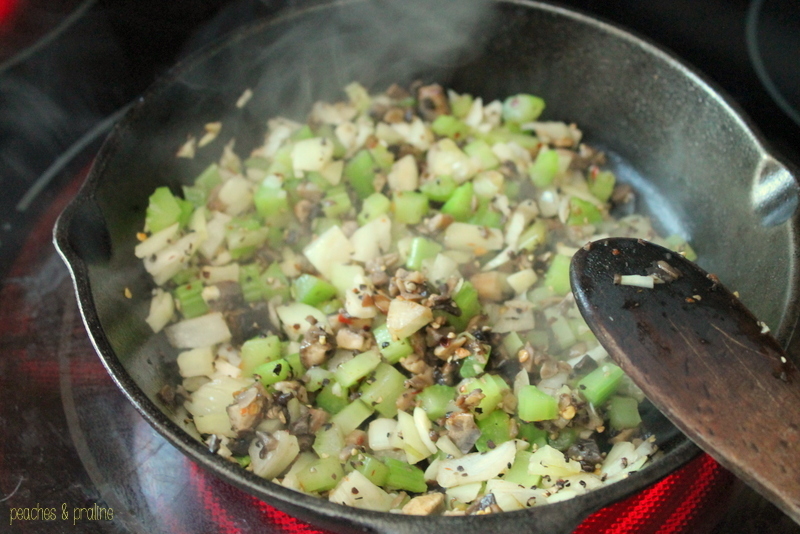 Saute the mushrooms, celery, onion, and garlic with half the black pepper and half the salt. 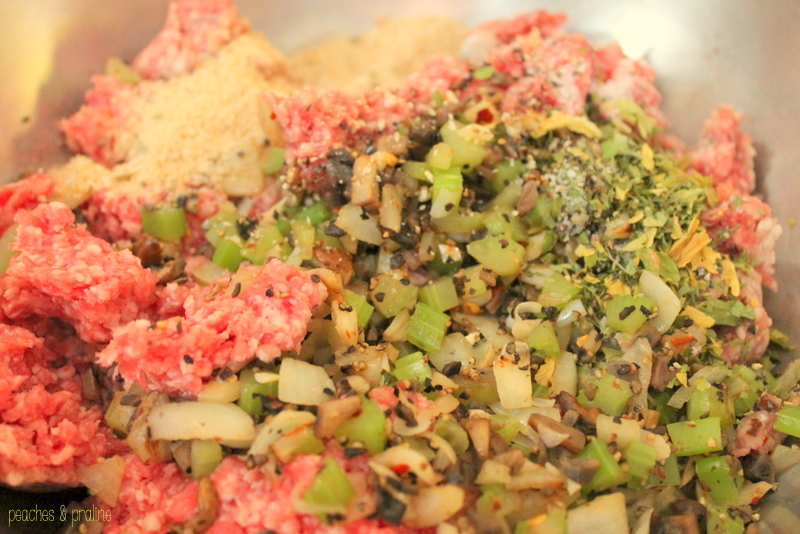 In a large mixing bowl, combine the ground beef with the vegetables, remaining spices, Worcestershire sauce, and breadcrumbs. 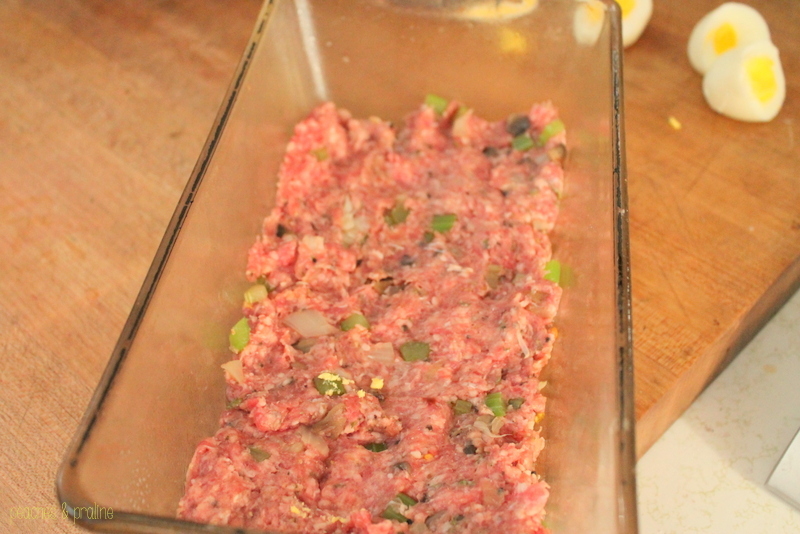 Press a little more than a third of the beef mixture into a lightly greased loaf pan. 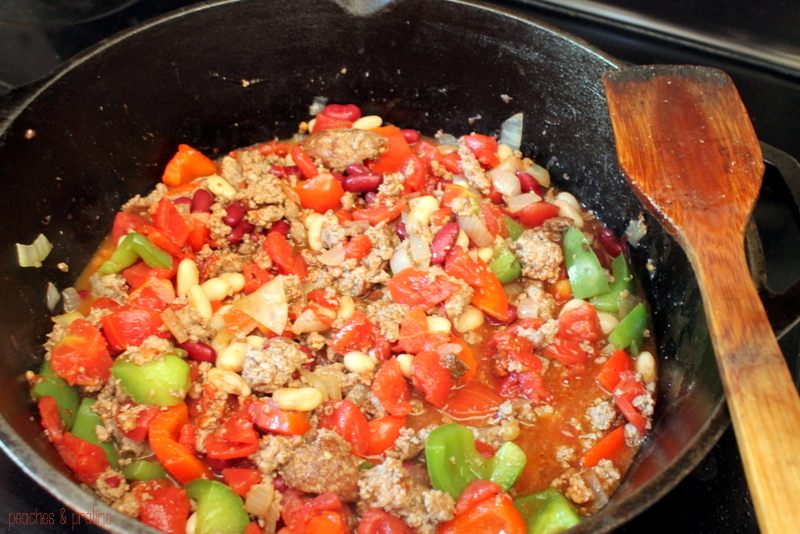 Add the sausage, then press half of the remaining beef on top. Repeat with the egg halves. Bake at 350 degrees for an hour. 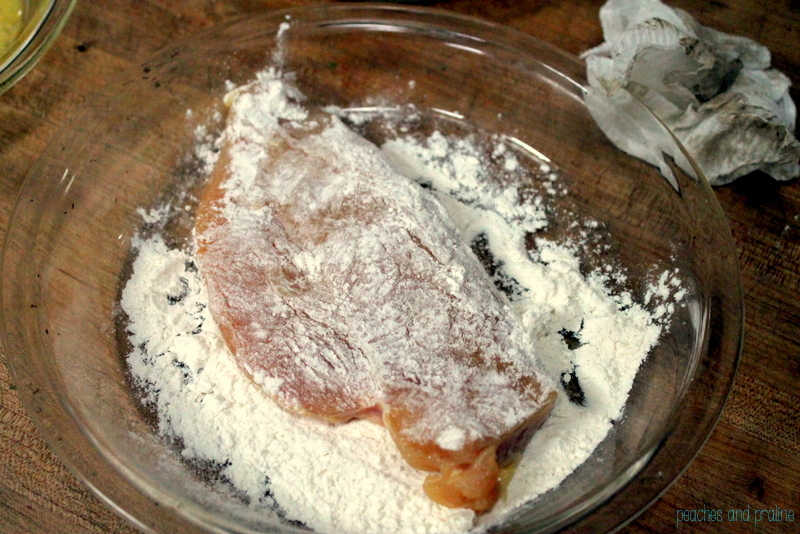 Remove from oven and drain out any accumulated grease; serve immediately after. Trick question time. What’s better than cornbread? 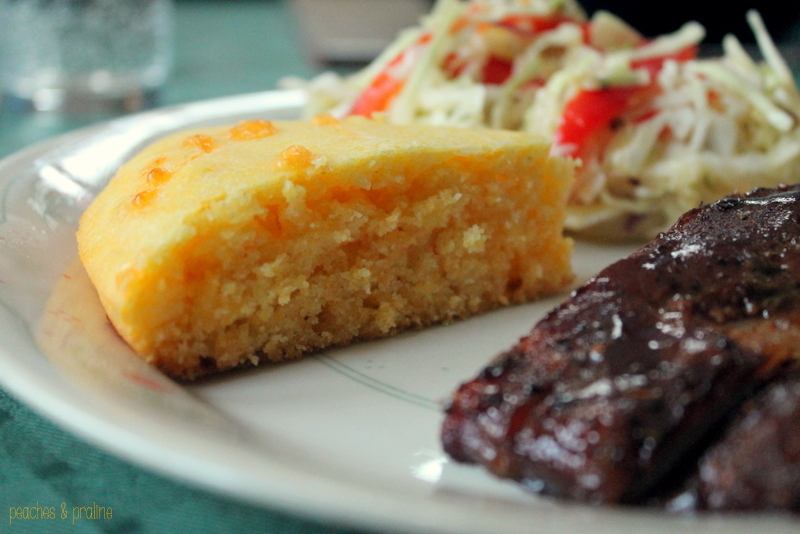 Answer: cornbread with cheddar cheese, and not much else. Now a real stumper: what’s better than cheese cornbread? Can I get a ‘yum’? 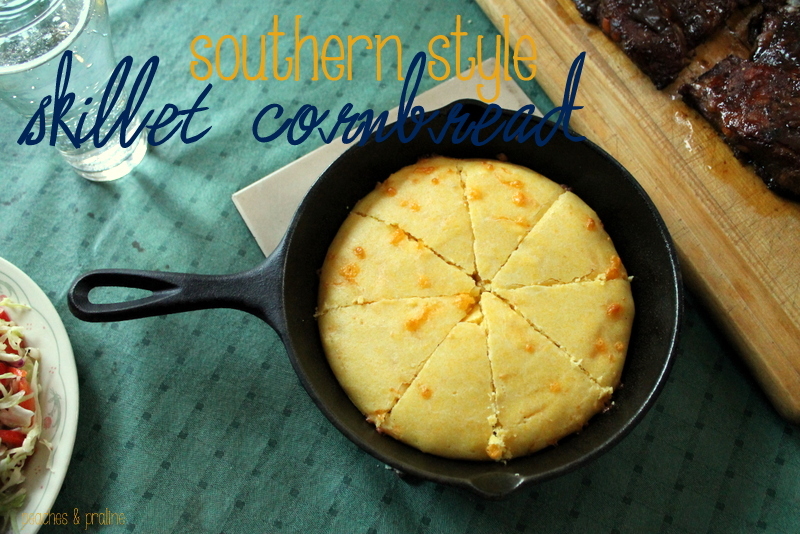 Cheese cornbread in a skillet. I know you’re probably saying to yourself ‘Bee, get a grip. How is skillet cornbread better than regular cornbread?’ and I have two answers prepared for that question. The first is that there’s more bread-to-pan contact, which means more crunchy bottom pieces and crispy cheese poking out of the sides. Did I mention there was cheese involved? The irrational answer is ‘because it is’, and I might have stuck my tongue out at the computer while I typed that. It’s not exactly hard to make cornbread, I won’t kid you there. But there are a few insider tricks to make your cornbread better; cooking it in a skillet is just one of them. Not overmixing is another. This skillet is also my favorite, and also the single cutest coking utensil ever. Soaking your cornmeal is the third and absolutely the best. You want to do this as early as possible; overnight is ideal. 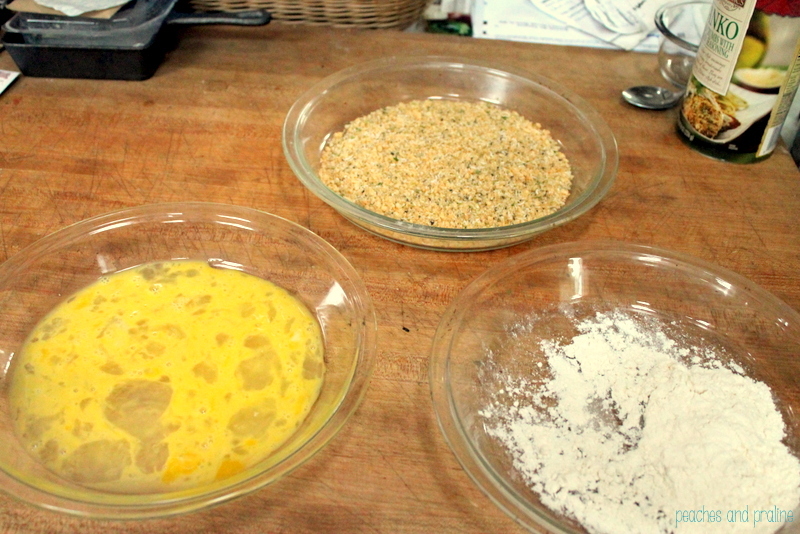 Measure out your cornmeal into a medium sized bowl and mix it right then and there with the liquid you’ll be using to make the bread, then cover and refrigerate. Every few hours go back and stir it up a little bit. Personally, I use buttermilk. 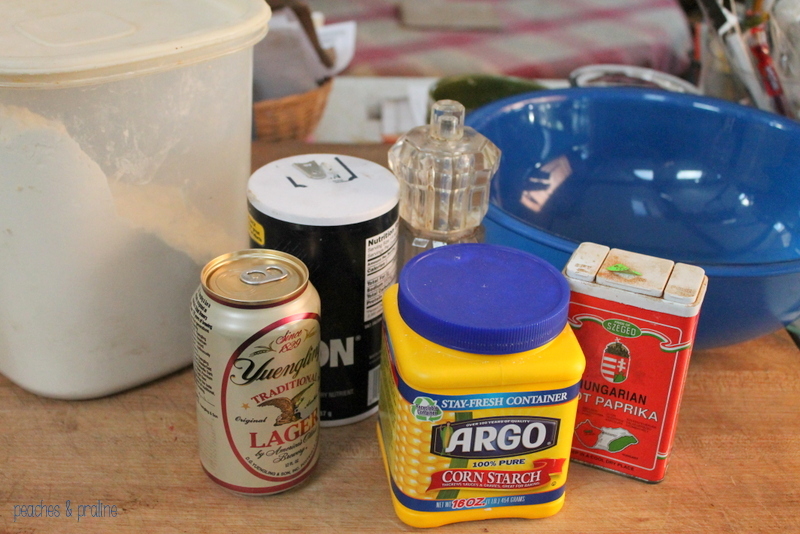 One of these days I’m going to split half-and-half between buttermilk and beer. 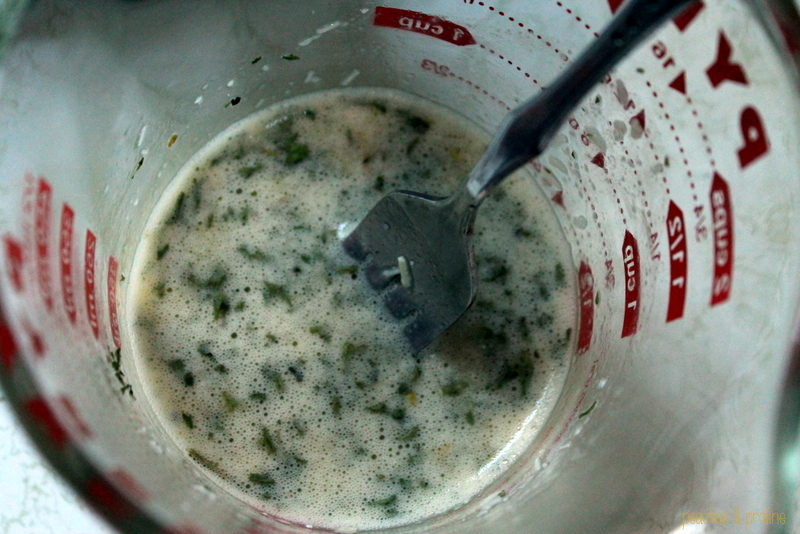 And really, regular milk works too if you don’t have buttermilk on hand (but pro tip: mix about a tablespoon of lemon juice with every half cup milk you use and you’ll get just about the same result). 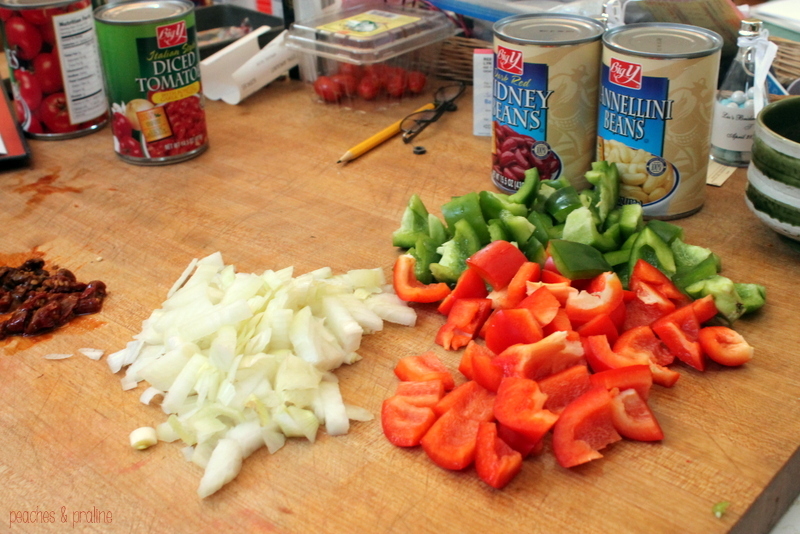 Here’s the recipe I used; I started with the basics to give you a backbone, but beyond that you can adjust as you see fit. 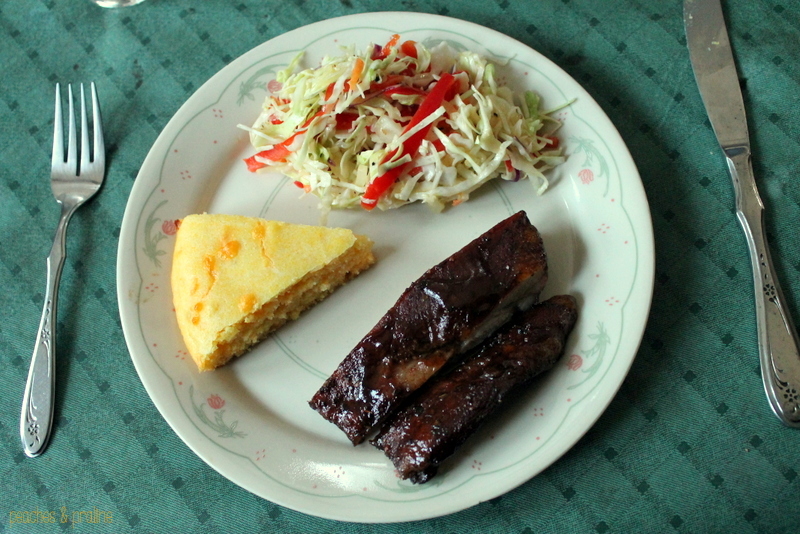 (Usually I use a tablespoon or two of sugar, too, but I wanted a strictly-savory bread to counter the sweet on the ribs and coleslaw.) 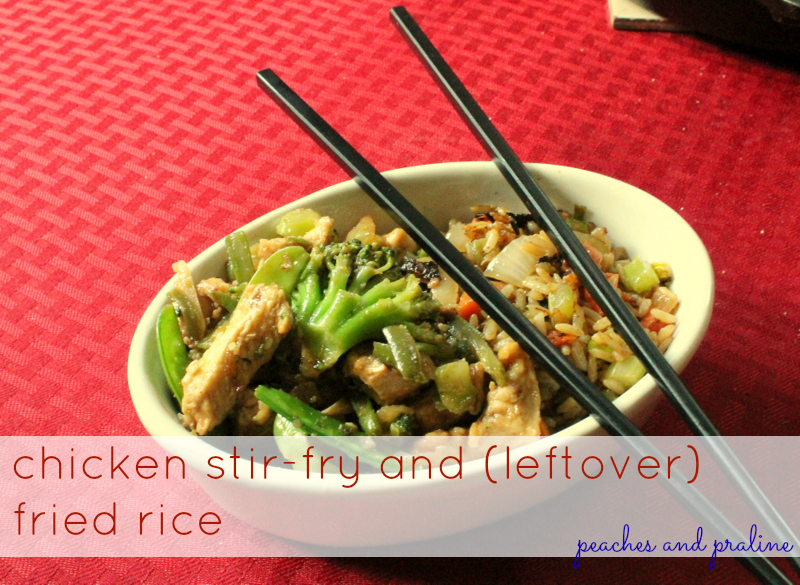 This recipe will make enough to fill a 6″ skillet; I suggest doubling if you’re planning on feeding more than four or five people. 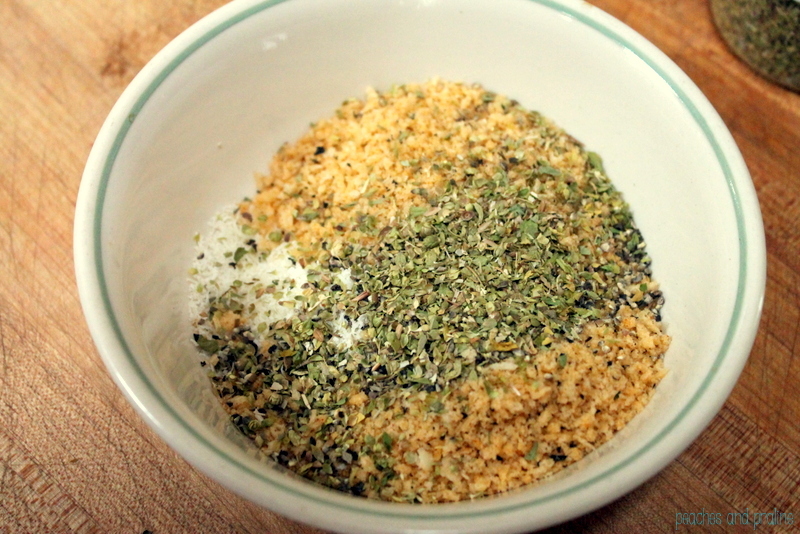 Before doing anything else, soak your cornmeal: mix with the buttermilk in a medium sized bowl. Let sit at least a few hours (preferably overnight). Preheat your oven to 400 degrees. 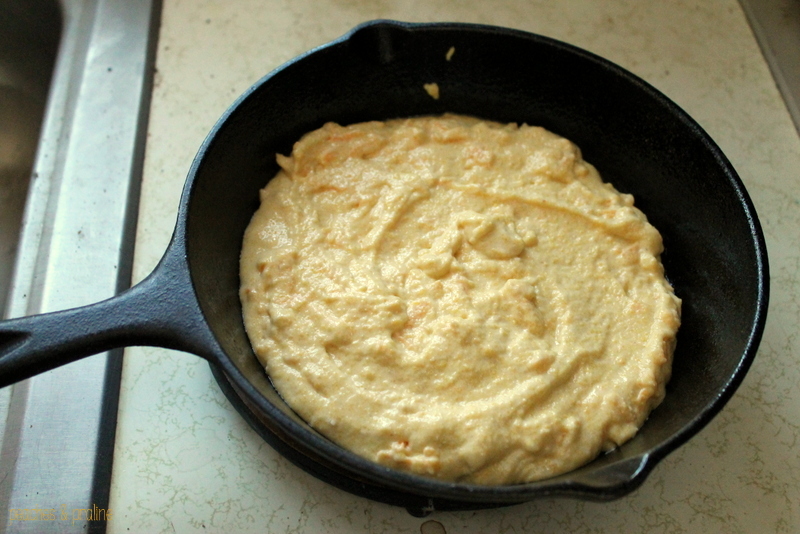 Heat a 6″ cast iron skillet over medium heat and melt 1-2 tablespoons of butter to grease. 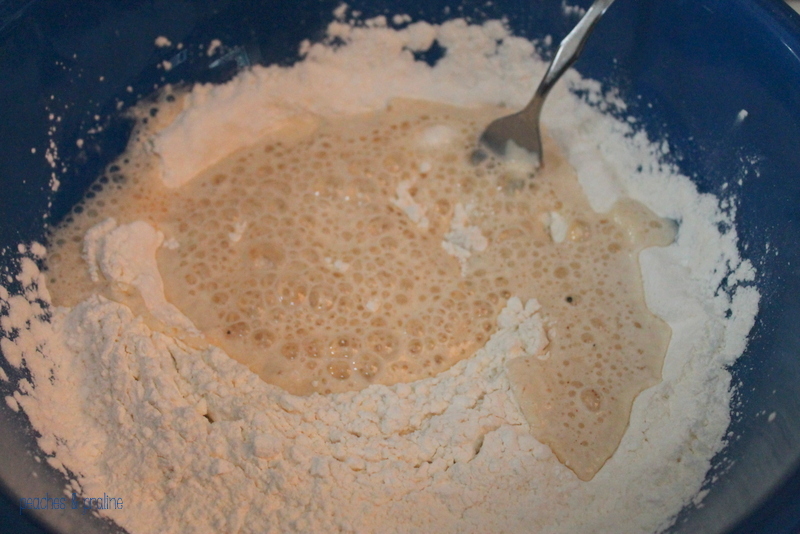 Combine flour, salt, baking powder, butter/oil, and egg white with the soaked cornmeal, mixing until JUST combined. 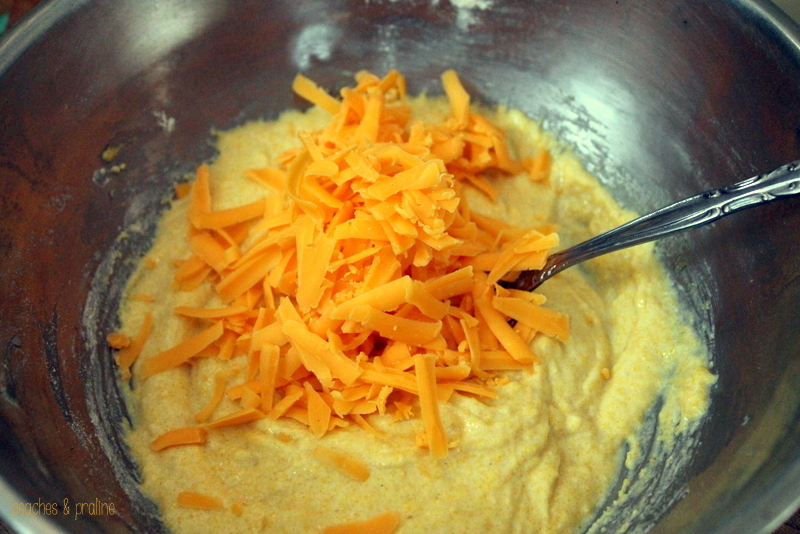 Stir in the cheese and transfer to the greased skillet. Bake for 25 minutes (the top will be nice and golden, and some of the cheese should have bubbled up to the surface) or until a toothpick draws clear. 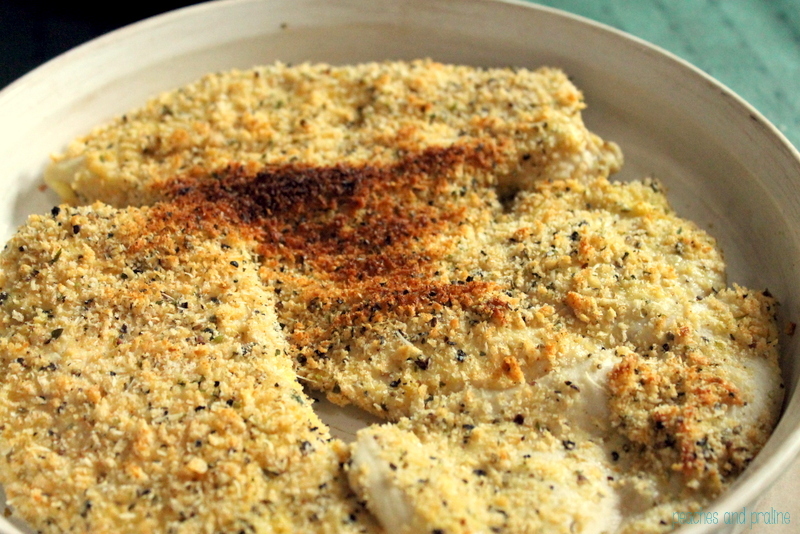 Let cool 5-10 minutes, then cut into wedges (with a butter knife, so as not to scratch up your skillet) and serve. 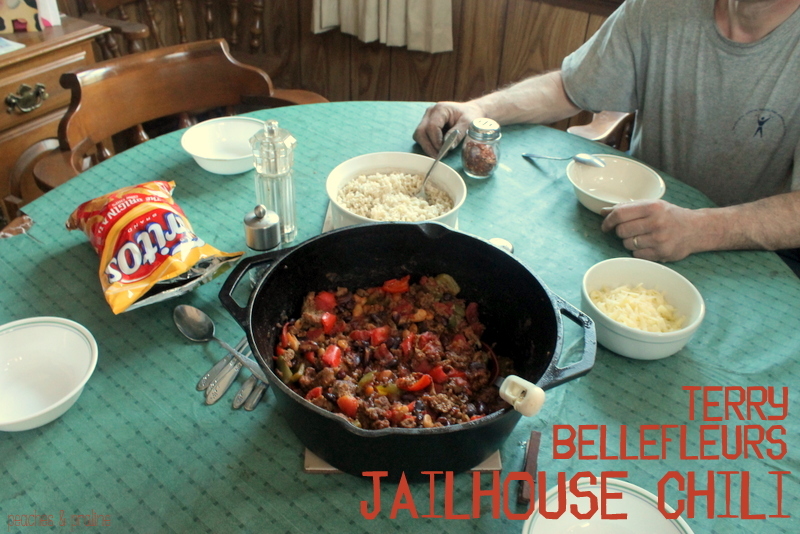 What did y’all have for Sunday supper?